Let's start at the very beginning, right? The other day I was speaking to a native Mandarin speaker from the Mainland, who asked me who I practise with, given that I live in Hong Kong where the native language is Cantonese, and where spoken Mandarin is "non-standard". He was shocked to hear that most of my time spent speaking Chinese is actually with Hong Kong people. In fact, he went as far as to say it would probably be better not to practise at all, than to practise with someone who doesn't speak "standard" Mandarin. This makes no sense to me. 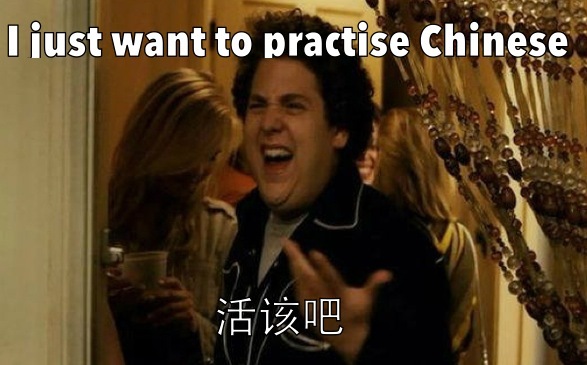 If I want to learn Chinese then I need to practise, and in fact imperfect practice is better than none at all. This reminds me of a great ironic post by Khatzumoto (founder of the AJATT "All Japanese All The Time" system) - definitely worth reading after you have finished reading this post! I'm just trying to give you a better education. F*** me, right? I did what I was asked. F*** me, right? I'm doing 60kmph in a 60kmph zone. F *** me, right? I want to make a living doing something I love. F*** me, right? I'm sure you get it now. Right? And that was basically how I felt when I was being told that I shouldn't be practising my Chinese with people who don't speak perfect standard Mandarin. Right? There's a lesson in here, right? Well, when I mentally linked my conversation to this meme, I started wondering how I might say that in Mandarin. Frankly, despite speaking to several native speakers, I didn't get a (literal) suggestion that I liked. But Yi (thanks Yi!) suggested something that did feel right, although disappointingly it doesn't contain any swear words. F*** me, right? She suggested the phrase 活该 (huógāi), which could mean "deservedly so" or "serves [you] right". I like this, and so my own variation of this meme - seen above - contains that phrase. I've added in the 吧 (ba) character to emphasis it's more of a leading suggestion than an actual question. Notes you might find useful, right? "Standard Chinese" is how people commonly refer to the variation of Mandarin which is the official version - because there really are so many versions & dialects. In Mandarin you would use the word 标准 (biāozhǔn). If you have suggestions for alternative translations, especially ones that contain swear words :-) then please leave comments below. I just thought you might be interested to note the above points. F*** me, right? A couple of years ago, I wrote a post entitled "Who's on First?" - which made reference to the famous Abbot & Costello sketch. If you haven't seen it, now would be a good time to watch that video. 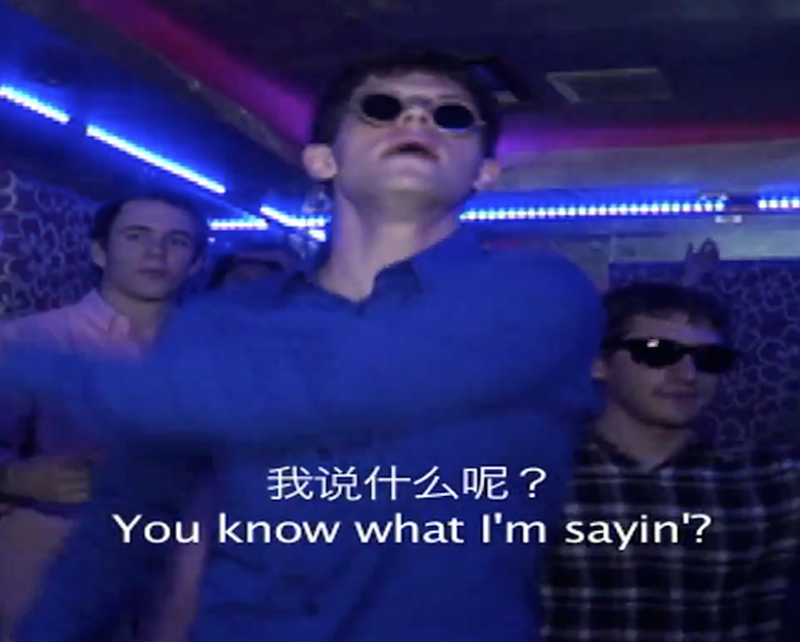 With all the hype around the Gangnam Style music video, there is even a Mandarin version called "Laowai Style" - I wrote a post that included the lyrics of the Chinese parodied version (and also included some vocab & grammar lesson :-). 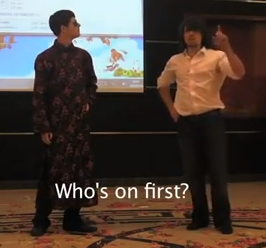 It was put together by Jesse Appell, and it seems that he has also created a Mandarin version of the "Who's on First?" sketch in Mandarin Chinese. Having just watched it, I can confirm that the humour still works, and in fact it doesn't even require a very high level of Mandarin to follow. Unless you have been based in the most rural parts of China without Internet access for a year, you will have come across the Gangnam Style music video (over 500 million views on YouTube!) - extremely catchy and definitely fun. And as with most popular music on the Net, that video has been parodied to death. The "Laowai Syle" parody is of particular interest to us in the Chinese/Mandarin circles, and a number of sites & blogs are already linking to it, such as Confused Laowai, ChinaSmack & Lost Laowai. Here's the video, have a watch if you haven't already. 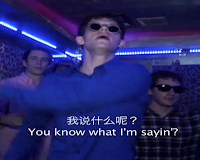 The lyrics written by Jesse Appell for this parody are really good, and they contain some interesting insights into Mandarin, which are worth exploring - and I'll do that below. I've looked around the web trying to find the lyrics - and came up empty-handed. So I spent some time this evening transcribing the lyrics off the above video. I opened a nice bottle of South African red wine to help the process (1999 KWV Cabernet Sauvignon, sometimes I spoil myself), and overall had a good time. Along the way I fixed a couple of spelling errors that appeared in the official subtitles, especially the one entire line about the BMW, where they got it totally wrong! And for those wanting to make it a little intellectual, I have included some "lessons" that might be extracted from the lyrics - you can find them in the final section of this post, below. (The type of Laowai who buys stuff at Silk Street but doesn't get ripped off) ? 老百性: Literally this is "old 100 surnames": The basic meaning, as I learned this evening, is 'regular' - as the lyrics suggest. It's like saying that it's what lots of people do. 破破烂烂 (pòpòlànlàn): This AABB pattern is quite common in Mandarin - probably the most common one being 马马虎虎 (mǎmahūhū, or: horse horse tiger tiger), which means 'so-so' or 'neither here nor there'). In this case, the literal translation is broken-broken-spoiled-spoiled, which has the meaning in the English lyrics as "crappy". Edits: (1) Corrected to 姓 as per Peckish' comment below; (2) Fixed the line relating to the BMW, thanks to a message from Yen about what it actually said! A couple of years ago, I wrote a post entitled The "sleeping cats" guide to pinyin pronunciation, which was actually one of my more popular posts, I guess because amongst all the beginners learning Chinese, it sometimes is the really simple stuff which is most confusing. Today, while doing flashcards, the sentence below popped up again, which reminded me of a common pronunciation mistake I used to make (and probably still make, I'm just in denial!) - and that triggered a desire to write another "pinyin pronunciation" guide - which is this post. - "Hold that pose, don't move," said the photographer. - "Bǎo​chí nage zī​shì, bié dòng," shèyǐng​shī shuō. I can't remember where I found this sentence, but somehow it made it into my flashcard pack. And reading it today immediately reminded me of how much difficulty I had at the beginning differentiating between pinyin's 'she' and 'shi' - and both sounds appear in the word for 'photographer' which is why this is a particularly interesting word (for beginners) or interesting sentence (for intermediates). The first syllable of ''shèyǐng​shī" is shè, which actually rhymes with the end of the word 'photographer' or perhaps I can even say 'photograph-uh'. The final syllable shī might best be written as 'shr' - sounding as if there is no vowel. Perhaps if you hear it pronounced correctly, it would be easier to understand? So visit MDBG.net​, (my favourite online dictionary, which I've written about before) and specifically look up the word photographer. You can hear it pronounced by clicking on (>>) and then on the audio button. Do it. So there you have it - a relatively common pronunciation mistake for beginners, but if you learn just one word correctly - photographer - you will have a clear picture of how to say it correctly. Forever. PS. If you haven't read it already, I've written a post in the past about the mispronunciation of the word 'pronunciation'. Check it out. I popped across the border from HK to China a couple of weeks ago (I have a multi-entry visa, so I may as well use it! ), and happened to see a couple of really clever stylised Chinese characters that felt more arty than just characters - certainly very cleverly put together. To my rather untrained eye, it looks like this character: 威 (wēi) - which has a dictionary definition of "power / might / prestige", and a Heisig keyword of 'might'. I actually think it's quite beautifully done! 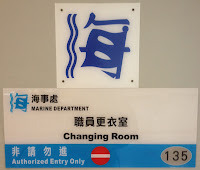 This one was easier to identify, being 海 (hǎi) - meaning "sea / ocean / maritime". 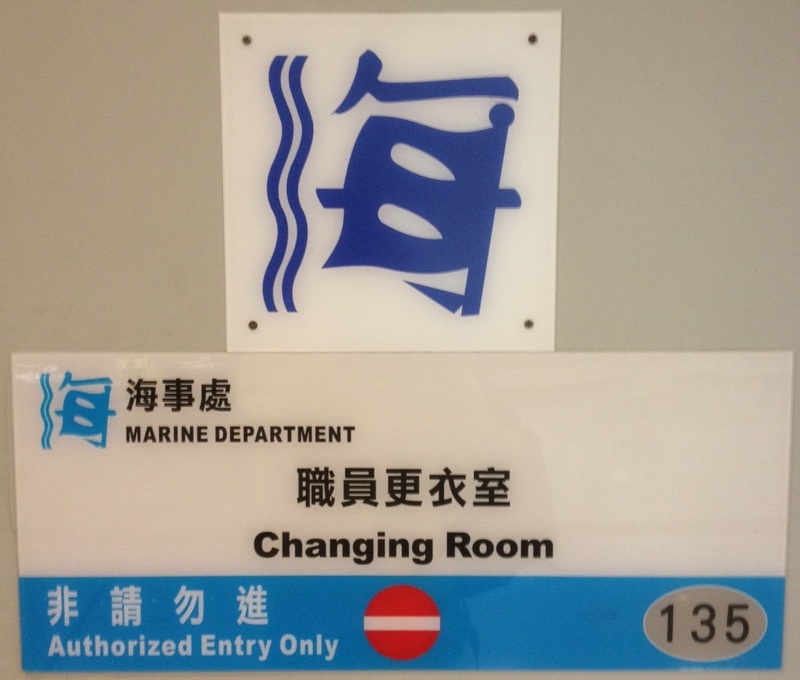 I left the full picture in, so you can see it is the logo for the Marine Department. 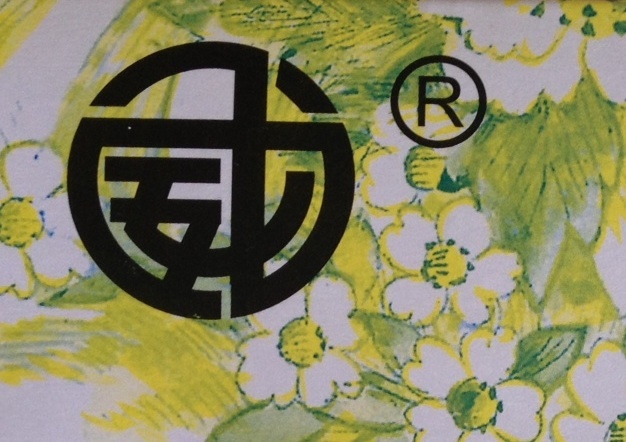 The water radical on the left has been replaced by a stream of water, and the 母 (mother radical) has been made to look like a flag - which suits what it is designed to represent. The other day, in response to something I said in a Mandarin conversation, the person replied, "船到桥头自然直" (chuán dào qiáotóu zìrán zhí). I stared blankly - these were words that my brain figured I should understand, but I didn't quite get what they were saying. Actually, it's a Chinese idiom - and I've had lots to say about such idioms in the past. Literally it means "When the boat gets to the bridge-head, it will naturally go straight", or in other words, "Everything will be alright." I made a note to copy this into my flashcards, and when I got home I typed "船到" into my dictionary, only to discover that there are actually a few idioms that begin when the boat arrives. Just stick to one image, OK? This post is for people who are using Heisig to learn to read & write Chinese, or for anyone using another image-based system with similar structure. If you look at the photo on the right (you can click on it for a larger version), you will see that all three of these consecutive characters use the '王' primitive. For example let's say that you're reading Chinese and see the character 汪. 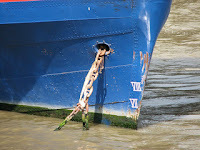 - and the image you constructed was based on "water ... jewels" as indicated in the photo. But later, when you try recall the meaning, you discover that "water ... king" doesn't ring any bells, and neither does "water ... ball". And so you fail. Please try, when you're creating images, to have just one image for each keyword, and stick to it. I wrote an article entitled Tips & Tricks for Heisig Visualisations back while studying Book 1, and even at that time I had a section devoted to "Pick just one meaning for primitives" - because experience showed quite early on that it's a recipe for failure. Chinese is hard enough when you do it right, so try to avoid the alternative. I have begun Heisig Book 2. Kinda. 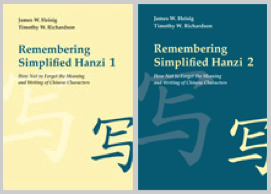 If you've been following my posts, you'll know that I have been preparing for a while to study the second book in the Heisig & Richardson series about learning to read & write Chinese. And I've been re-discovering good things too! I set myself a goal to begin on 1 July (after fully re-studying Book 1), and to finish by year-end. Although I did the first book in about 3 months, I decided not to get carried away this time. The bad news: I'm already behind schedule. I thought I would begin at about 10 characters a day, expecting to slow down as I needed more time to revise. As of last night (21 days in) I had learned just 170 characters. I have also done a lot less revision than I should have done by now. Damn. It is definitely going more slowly that Book 1 - but that isn't a surprise, right? So I'm really enjoying myself. Time constraints prevent me from doing any more time than I'm doing at the moment, but I'm enjoying the progress - and the fact that I'm already recognising characters from around, shows it's already adding value.